Residents of Dalton Gardens say they appreciate its open spaces and mountain views. 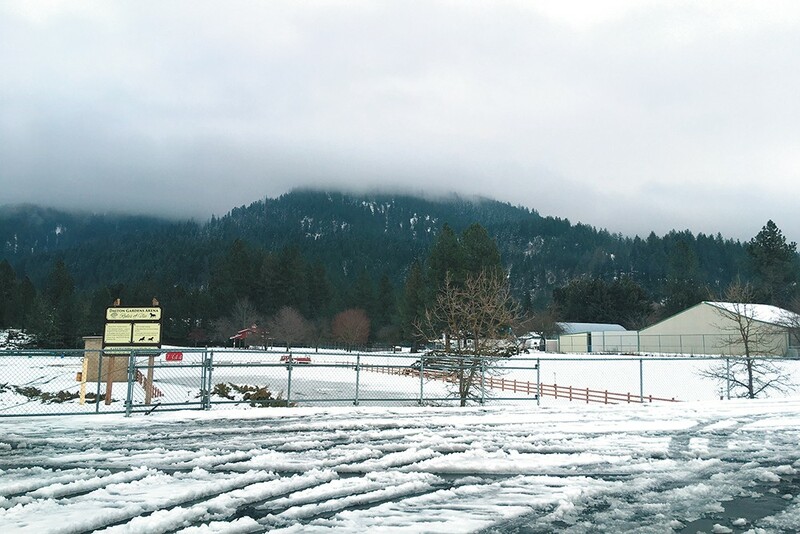 As sidewalks suddenly drop off, and backyard pastures come into view, it's easy to tell where neighboring Hayden and Coeur d'Alene end and the small North Idaho city of Dalton Gardens begins. There's a distinct shift in character in the suburb of roughly 2,400, where winter fog clings to the tree-covered foothills that border its valley one recent January day. Plenty of homes here sit on "Dalton Acres" — only a full acre if you count the road out front. Many boast front yards and acreage in the back providing space for horses and massive gardens that hearken back to the area's farming history. There are no streetlights, no sidewalks, and there's no sewer system either. That's how the people here like it. But recently, there's been a rift, a growing division among the neighbors in this community as they debate whether one family's proposal to build a couple homes on back acres could threaten the very character of the city they love so much. With the city striking a deal to allow the family to build beyond what current city ordinances allow — a move that opponents worry could open the floodgates to other development — the opposing outcry has sparked a recall effort, with the mayor and all four City Council members placed on a special March ballot with the potential to be ousted from office. At the heart of it all, Dalton grapples with two values intrinsic to the semi-rural area: property rights and government fairness. Back in 1975, Jerry Streeter's parents decided they wanted to divide their 5-acre Dalton Gardens property, keeping their home and the land it sits on and setting aside an acre for each of their four boys. It wasn't until 2016, after both parents had passed away, that Jerry Streeter was tasked with settling the estate. By that point, Jerry and his two living brothers, and the widow and children of their other brother, stood to inherit the properties. He went to the city to make sure the lots that had been divided out roughly 40 years before could be sold and built on. "As soon as my mother passed away, I started this process because I wanted to divide up the property and get the estate settled, that's what triggered all this," says Streeter, 62. The city was ready to work with the Streeters until concerned neighbors, including lawyer Jeff Crandall, intervened. The city, they argued, has an ordinance that doesn't allow for homes to be built on lots with less than 110 feet of street frontage, which would make the back three lots on the Streeter property not buildable. With that and other concerns brought up, the city opted to hold off, and eventually, the Streeters sued. Their property had been split up a month before that 1975 frontage ordinance was passed, and it should be grandfathered in as a result, the Streeters argued. A judge encouraged the parties to settle, and Dalton and the Streeters soon did that: Instead of four new homes, the family would be allowed to build three, with the back three acres now split in two and accessible by a new easement for a driveway through the front properties. That seemed to be the best fix to all involved, Dalton Mayor Steve Roberge says. "Ultimately what we're looking at here is the property rights of Dalton residents that have lived here for 60 years," Roberge says. But neighbors who've organized under the name "Save Dalton Gardens" argue that the back land shouldn't be grandfathered in and they've filed a suit to try to stop the city from allowing homes there. They claim other developers could try to do the same elsewhere in town, and they worry that if enough development happens, individual septic systems might no longer be allowed. If required, a city sewer system would be costly to property owners, Crandall says. But the city contends any precedent the settlement might set would only apply to properties that were divided before the 1975 rule was passed, and they know of only one other property that might apply to, Roberge says. "The only people it'll effect is the Streeters and the individuals that live around that property," he says. Crandall says he wonders why the Streeters shouldn't have been required, like most everyone else who wants a project to go outside of city rules, to get a variance — a public and individualized process that allows the City Council to make an exception, or not. "If you really boil it down, that's why I'm fighting this," Crandall says. "I think laws need to be enforced, and they need to be enforced without prejudice, without bias. It doesn't matter how long the Streeters have lived in this community." So Save Dalton Gardens is suing the city to argue its case and keeping an eye out for building permit filings or other actions allowed under the settlement that might require an injunction to be put on hold, Crandall says. In the meantime, the group is leading a last-ditch effort to oust the city government. "I don't fault the Streeters at all for trying to maximize the value of their property as property owners," Crandall says. "Our dispute is not with the Streeters at all, it's with the city and what the city is doing and allowing." The reason people want to live in Dalton Gardens is because of its unique character, Crandall explains. "It's very quiet, yet it's close to everything else that's in town, and Dalton residents kept it that way on purpose," Crandall says. "They want to feel like they're living out in the middle of nowhere, and they're not." Mayor Roberge agrees that large properties are what make Dalton unique, and despite concerns, says he'll fight to maintain the city's character. His family settled in the area in the late 1800s and he's served in leadership roles there for nearly 20 years, including 16 years on council and the last three and a half as mayor. "Nobody is trying to change that at all," Roberge says. "I love Dalton Gardens. ... I will do nothing that will harm this city." The mayor and the four council members, who make $850 and $400 a month respectively, (a dollar amount that hasn't changed in nearly 20 years), are all up for recall on the March 12 ballot. About 345 to 355 people signed recall petitions for Roberge and each of the council members, including Joe Myers, Denise Lundy, Jamie Smith and Scott Jordan. For a recall to happen, a majority of voters in the election need to agree to recall that official, and there must be at least the same number of votes as the number that voted them into office in the first place. That number varies for each official: Roberge (345), Myers (110), Lundy (112), Smith (418), and Jordan (337), according to the Kootenai County Clerk's office. Having the entire city government up for recall is at the very least exceedingly rare. The Idaho Secretary of State's office had to be consulted for what would happen should the city be left without enough officials left to appoint others to any vacated seats. "The governor would appoint enough councilmen so there's a quorum, once there's a quorum the council would fill the other positions," says Tim Hirst, chief deputy secretary of state for Idaho. "Normally the governor reaches out and asks for recommendations from the people in that community, and he interviews the candidates and will select a couple." Save Dalton Gardens continues to try to make its case to voters, including that it feels city dealings were wrongfully moved behind closed doors using claims of pending litigation, and that removing the officials "from office before they can cause further damage to this city is critical and essential." The Streeters feel caught in the middle, waiting to find out if and when they can list their property. "We've got a list of people interested in buying the acres as we speak," Jerry Streeter says. "It's just very frustrating, losing two-and-a-half to three years, 'cause we're not — the boys — getting any younger." Roberge, meanwhile, working with others under the name "Dalton Gardens Property Rights," has tried to distribute more information, including that the city wouldn't be required to switch to a sewer system if the Streeter property is built out (as confirmed by the Panhandle Health District) and that the city does not plan to divide and make more back acres buildable. The original print version of this article was headlined "Dividing Lines"